Sixteen years ago, while on my way to church, I noticed and old abandoned school-house. It was fairly small and made of red brick. The windows were busted out, the grass and weeds had taken over and the doors were boarded shut. It was a tired, lonesome building, chocked full of memories of days gone by. There was something else that caught my eye that day. A rock. That’s right, a rock. Right in front of the old school building was a big old rock, just sitting there, and from the look of things, it had been there for many years. It was a long narrow stone, sitting up on its side kind of like a monument. If only that rock could talk I thought…oh the stories it could tell. I could just imagine school kids playing chase around it, or a beau waiting there for his sweetheart to come out of class, or a teacher telling her class to line up at the rock, or best friends meeting at the rock after school. Maybe a first kiss or even a marriage proposal happened there. My imagination ran wild thinking of all the history surrounding that one rock. Time rocked on, week after week, month after month and year after year, for thirteen years, I passed by that old school and that big rock. Every time I saw it would think to myself, I want that rock! It needed a new home and a new purpose and I wanted to be the one to do it. On one occasion I told Mr. 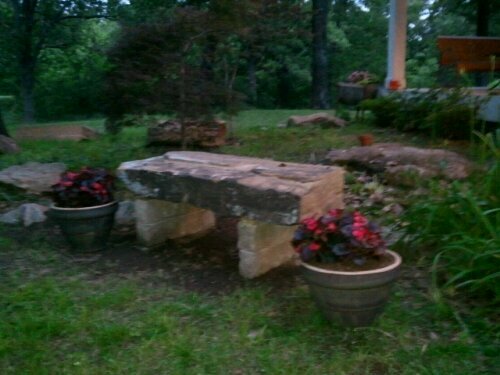 Wonderful about the rock, how I wanted to bring it home and make a bench out of it. “This rock is perfect”, I said, “it would make a perfect bench”, I continued, “I know exactly where I want to put it too, I just don’t know who to ask about it, or how I would even get it home, I just know I want it.” I’m sure Mr. Wonderful must have been thinking, oh lord, here we go again with another one of her hair brained ideas. Maybe if I ignore her she’ll give up. Years went by…literally years…almost thirteen, and still, every time I passed by that old school, I would check to make sure it was still there and say to myself, one day I’m gonna get that rock, make a bench out of it, give it a new home and new purpose. One day, while on my way to church, my heart sank when I saw that they were tearing down the old school building. I immediately looked for the rock, that by now, had been taken over by tall grass and out of control weeds. I anxiously scanned the area, hoping they hadn’t already moved it. There it was, in the same place it had been for decades, waiting to be hauled off with the rest of the debris. I immediately called Mr. Wonderful knowing he would quickly swing into action. “You’re not going to believe what I just saw!”, I said. “what’s that?” He replied. “They’re tearing down the old school-house on Lynn Lane. You need to get over there as soon as you can to get that rock. “What rock?” He said. Clearly, it was not as important to him as it was to me. When he got home I said, ” well, did you look at it? What do you think? Can we get it?” He kinda paused and said in his reasonable tone, “well Tonya, I did look at the rock, and well, that’s a pretty big rock, a really big rock. I’m not sure know how we will ever get it here”. And that was it. Conversation over, or so he thought. For weeks I watched as they cleared off the lot, one dump truck at a time, hoping and praying I could get the rock before it disappeared. One morning I pulled over on the side of the road, tromped through the wet grass to asked the workers if I could have the rock. No one seemed to care if I took it or not. I was one step closer, but I still had to deal with Mr. Wonderful, whose name was getting ready to be changed to, Mr. I can’t move a rock. A few days later, when I drove past the familiar lot, I was saddened when I saw that everything had been hauled off. Nothing was left. All of the debris and equipment were gone, and the dirt on the lot was smooth and ready for new construction. Slowly, I drove by, searching, and to my utter shock and delight, it was still there! I couldn’t imagine why they left it there. It was clear that all their work there was done. So, I took it as a sign. I was supposed to have that it. That night I brought the subject up once again, and once again Mr. Wonderful explained to me how we couldn’t get the rock. “Tonya”, he said, “that rock is much bigger that you think, it probably weighs 700 pounds?” “There’s no way”, I explained, “it can be that big, you and I can just go over tomorrow, pick it up and put it in the back of your truck”. He just smiled, shook his head and said, “no we can’t Tonya. It’s bigger than it looks…” This is when his voice began to sound like the teacher on the Peanuts cartoon…you know…wa wa wa wa wa wa…as he listed the fifteen reasons why this would never work, and I began to drift off to a happier place, a place with a rock bench. Time for plan B, a plan without Mr. Wonderful. My mind began to race. All I needed, I thought, was a couple of guys with good backs and a pick up truck, so off I went to find them. After two days, multiple conversations and dead ends, I finally stumbled on to the jack pot. My good friend MarLynn asked her husband, who owns a construction business, if he thought he could help me with the rock. He said yes and agreed to go and take a look at it. He went to the empty lot with his flat-bed truck and his Bob Cat and went to work. But soon he found out that…and I really hate to say this…but…Mr. Wonderful was right…as usual. The rock was big. REALLY BIG. As a matter of fact it was GIGANTIC! The part that was visible, the part that I had been swooning over for thirteen years, was just the tip of the iceberg, literally! Come to find out, the rock was buried over three feet deep and weighed over 3000 pounds! (Oops. it didn’t look that big from the road 😉 ) With much digging, determination and hard work Daniel was able to get the rock out of the ground and on to his truck. He brought it out to our property and worked another couple of hours cutting it down to the perfect size. Here’s the finished product. It’s perfect! Thank you MarLynn and Daniel for making my dream come true. And thank you Mr. Wonderful for being patient with my crazy ideas. Now the rock has a new home, a new purpose and many more years of use in a whole new way. What did I learn from this? Never EVER give up on a dream, a person or a goal, no matter how big or small it may seem. If it’s worth dreaming about, its worth fighting for. Christ fights for us much the same way. He sees us, our potential. even if we are lost, abandoned and seemingly useless, He still sees us. Not for what we appear to be, but for what he wants to create in us and through us. Yes! Thank God for his vision! Tonya, Your stories always remind me of things I’ve told of my life, but never actually wrote them down. Like the huge rock in our yard in Seminole that we played “King of the Mountain” on. A few years ago I drove past that house and the rock had been shaved off to make way for a driveway. How sad I was. Then there were the rocks down by the creek on Norman’s property in Sand Springs when we married in 1998. 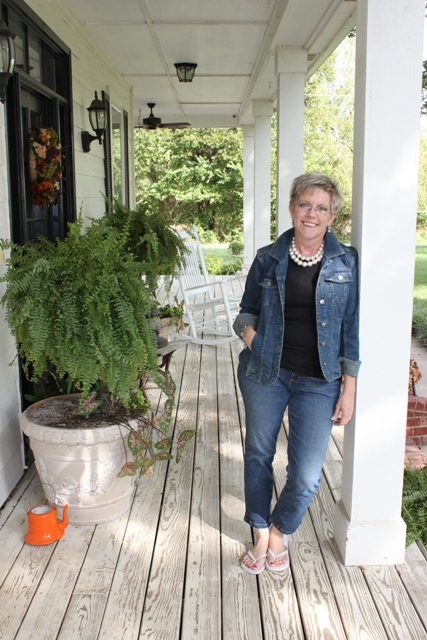 After we sold that place, I insisted on bringing several of them to our new home in Bixby. He only lived 10 years after that, but I can always remember our execiting times each time I look at my Rock Garden. Be sure to keep all these stories and compile them in a book for your family someday.